While many birders have been focusing on butterflies, dragonflies and moths I have been out birding – a little bit at least – during what is generally regarded as the close season for birds. 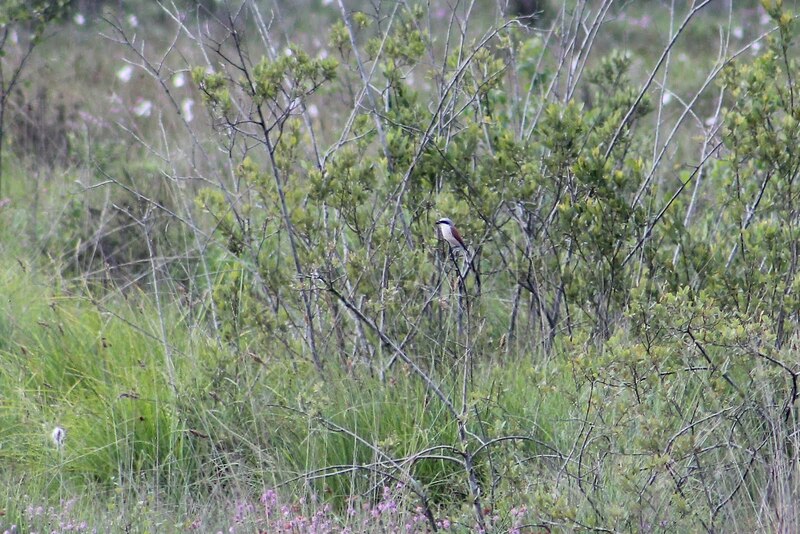 During this glorious summer we are having, I took in a second visit to Thursley Common last week to catch up with the male Red-backed Shrike. I had made a failed attempt a couple of weeks before when the bird first went missing having been seen consistently viewed near the Pudmore Ponds area. That day turned out to be a bit of a disastrous attempt to visit the Common as the local village was hosting some event around the car park area, with a loud PA and plenty of excitable children around the place. Not what you expect from a visit to this normally serene site. No wonder the Shrike had gone into hiding that day. I wasn't expecting it to be seen again but luckily local Homethorpe birder Richard Perry rediscovered it in a fenced-off area where a small herd of Belted Galloway cattle were grazing a few days later. I put the word out on Rare Bird Alert and headed over there myself later that week. It was a searingly hot day – hardly ideal conditions for walking around the dusty, tinder-dry Common – but there were a few birders around looking for the Shrike. 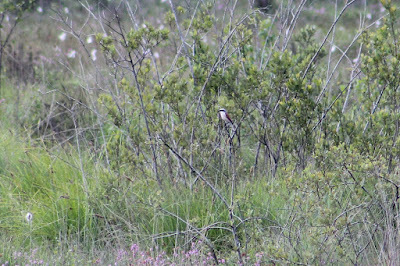 I focused on watching a few Dartford Warbler before making a circuit of the area, and was fortunate to find the Red-backed Shrike perched up on some shrubbery. This was my first for Surrey, which was nice. The views were distant but that didn't matter. A very smart bird. I popped in at Oare Marshes on Monday, after a visit to Margate to take my mum to a hospital appointment. 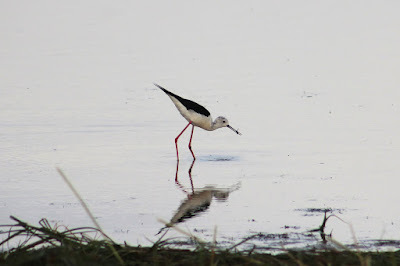 I didn't stay long, but the two adult Black-winged Stilt and two juveniles were easy to locate on the East Flood, unlike the Bonaparte's Gull, which was no doubt on the estuary somewhere with the tide out. I occasionally have taken a short walk around the Water Colour and Moors areas of my local patch at Holmethorpe during the early summer, with a pair of Common Tern successfully breeding on Mercer's Lake on one of the pontoons there – only the second successful attempt on the site. The first of three chicks currently survives, but there is a long way to go before we can truly celebrate. Really striking looking bird! I have never seen a Black-winged Stilt before, really wonderful photography. Nice work. Thanks for the share, hope you had a fantastic weekend. Keep up the posts.